From December 19 to 23, a delegation of 27 members headed by Lee Yong-jae, Speaker of Jeollanam-do Provincial Assembly from South Korea visited Fuzhou, Xiamen and Pingtan Comprehensive Pilot Zone. On December 20, Zhang Guangmin, Vice Chairman of Fujian Provincial People's Congress Standing Committee, met Mr.Lee in Fuzhou and introduced the system of People’s Congress and the structure of Fujian Provincial People’s Congress. 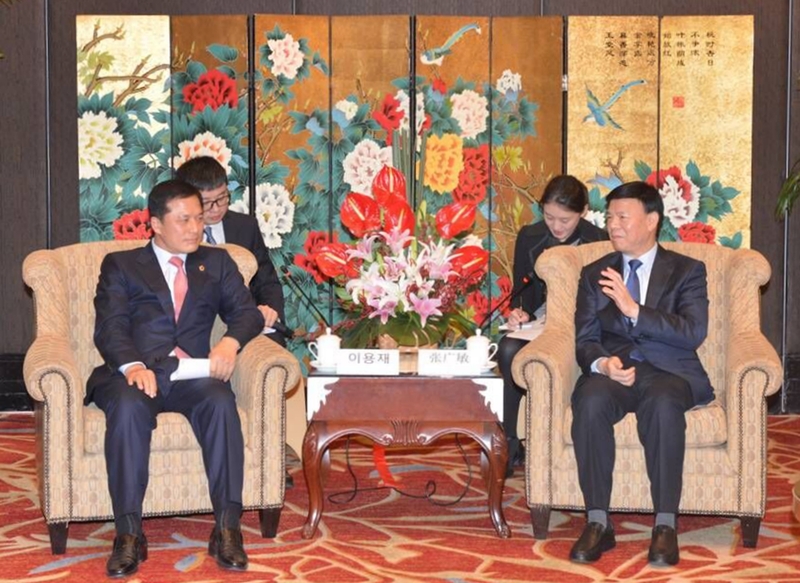 He called for closer exchanges between the Provincial People’s Congress and Jeollanam-do Provincial Assembly and hoped that the two legislative bodies can facilitate more mutually beneficial cooperation and promote friendship between the two provinces. Lee applauded Fujian’s development and proposed both provinces explore cooperation projects in ocean and aquatic products. He invited Fujian to attend next year’s International Agricultural Exhibition and E-mobile World Expo in Jeollanam-do to explore cooperation opportunities in agriculture and IT industry. During the 4-day trip, the delegation interacted with the standing committee of the Provincial People’s Congress and South Korean students studying at Xiamen University, and visited the Island Research Center and Pingtan Comprehensive Pilot Zone. Impressed by Fujian’s economic and social progress, in particular its bustling opportunities in maritime industry, tourism and education, the delegation members pledged to lend greater support for bilateral exchanges and cooperation in the future. This is Jeollanam-do Provincial Assembly’s second visit to Fujian in recent years. The two provinces have made a lot of headway in practical cooperation and exchanges since the establishment of friendly exchanges and cooperation relationship in 2007.